INDIANAPOLIS, IND. (August 2, 2018) — Klipsch®, a leading premium global audio company, today announces the debut of its new ReferenceTM series speakers. It is an enhanced version of the company’s acclaimed Reference series, in which many models dominate NPD’s list of top-selling home audio components*. The series is comprised of 13 models — including Dolby Atmos® enabled speakers and powered monitors — all infused with the cosmetic and material upgrades, and the latest technological audio advancements. Now in its sixth generation, the Reference series speakers deliver even higher sound quality precision, clarity and effortless power. A new, larger proprietary Tractrix® horn provides improved coverage and bandwidth, and new tweeter and phase plugs ensure greater accuracy. The new rear Tractrix ports produce deep, powerful bass. The line also exudes modern elegance with several new cosmetic upgrades, including angled feet, full-length low profile magnetic grilles, and a scratch-resistant black wood grain vinyl finish. Industrial-style fasteners and spun-copper IMG woofer cones emphasize the signature Klipsch Reference design aesthetic. “The new Reference series speakers combine modern materials and technology to create an unforgettable, unrivaled music and movie listening experiences at these price points,” said Kerry Geist, product manager for Klipsch. The 13 new Reference series models consist of four floorstanding speakers (R-625FA Dolby Atmos enabled, R-820F, R-620F, and R-610F), two center channels (R-52C and R-34C), four bookshelf speakers (R-51M, R-41M and two powered monitors R-41PM and R-51PM), one Dolby Atmos elevation speaker that can also be used as a surround speaker (R-41SA), and two powered subwoofers (R-120SW and R-100SW). The Klipsch Reference R-51PM and R-41PM powered monitors eliminate the need for an external receiver and are designed to easily connect to a turntable, television, computer or wireless device. The powered monitors are equipped with an integrated phono pre-amp, Bluetooth® wireless technology, digital optical, and analog RCA and USB inputs. A new feature and a first for Klipsch powered monitors is Dynamic Bass EQ that dynamically increases volume at low frequencies to match the human ear’s ability to perceive bass. 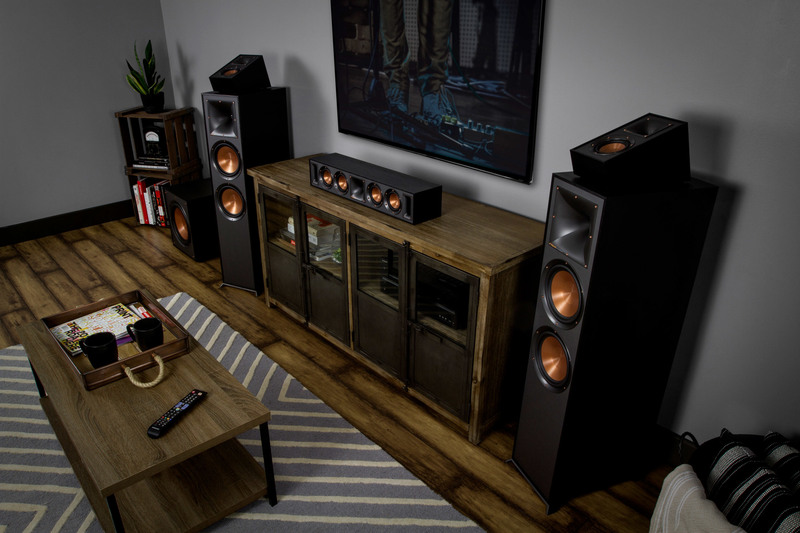 Price points for the new Klipsch Reference series span U.S. MSRP price points ranging from $498-$1,198 for a pair of floorstanding speakers, $199-$499 for a pair of bookshelf models, $249-349 for a center channel, $399 for a pair of surrounds, and $349-$449 for the subwoofers. They are now available at select retailers and at Klipsch.com. For more information on the Klipsch brand and its Reference series speakers, visit Klipsch.com. *Source: NPD data May 2016 – April 2018 in dollars and units. Klipsch®, Keepers of the Sound®, and Tractrix® are registered trademarks of Klipsch Group, Inc., registered in the U.S. and other countries. Klipsch Group, Inc. is a VOXX International Company (NASDAQ: VOXX). Dolby Atmos® is a registered trademark of Dolby Laboratories. The Bluetooth® word mark is a registered trademark owned by Bluetooth SIG, Inc. and any use of such mark by Klipsch Group, Inc. is under license.